Shakespeare in Context: Information Text about soliloquies, with a particular focus on their role in Macbeth. 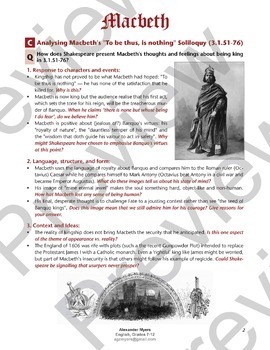 Close Reading & Extract Analysis Activity: This activity guides through a sample extract analysis question (the “To be thus is nothing” soliloquy), and can be used as IGCSE or even IB exam practice, or can be used simply as an excellent close reading activity. 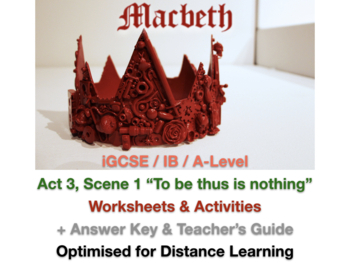 MODEL ANSWERS for all the questions + activities as well as a teacher’s guide and further in-depth analysis and commentary of the relevant lines from Act 3, Scene 1.